On-the-job training can be a useful tool if you are seeking work in web development. Most people learn to use key tools by messing around with them in the process of doing work. This is usually accompanied by occasional questions directed at colleagues, extensive use of the Help system for the software in question, perusing of YouTube videos on the topic, reading of books on the topic, and extensive searches of online bulletin boards used by people experienced with the software. On-the-job training (OJT) is a great way to learn things, and it’s the default method for a lot of software education. However, because you’re picking things up as you go along, you don’t know what you don’t know. There can be entire approaches to using a tool, or key tips and tricks, that you simply never run into if OJT is all you have. 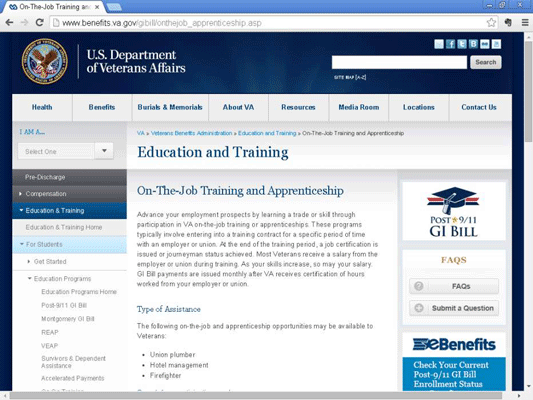 You should consider augmenting OJT with an online course or a book. Either will give you the outsider’s perspective and collected folklore needed to take your use of the tool to the next level. Because OJT happens in a work environment, the licensing situation is usually pretty good as well. Major tools should be covered by site licenses such that everyone who needs to use a tool has it, and everyone is on the same version. Check out this list of on-the-job training and apprenticeship programs for the U.S. Department of Veterans Affairs, widely known as the VA.
Corporate IT often tries to save money by limiting licenses tightly, not upgrading to a new version of software, and so on. There is also often limited internal support for tools beyond the core office productivity suite. It often comes down to the company saving a few thousand dollars while people who are, as a group, making millions of dollars a year in salary are slowed down or stopped in their work. Coordinate with other web development professionals in your workplace to call attention to inadequate licensing and support policies, and get them fixed — or consider moving to an organization that can make these basic necessities available to you gracefully. What is often challenging at work is getting the tools that you use at work, especially the latest versions, onto your own personally owned computer that you might prefer to use for some work at your job, as well as for side jobs outside the main workplace. Try to get support for licensing that lets you use all the tools that you can bring to bear.